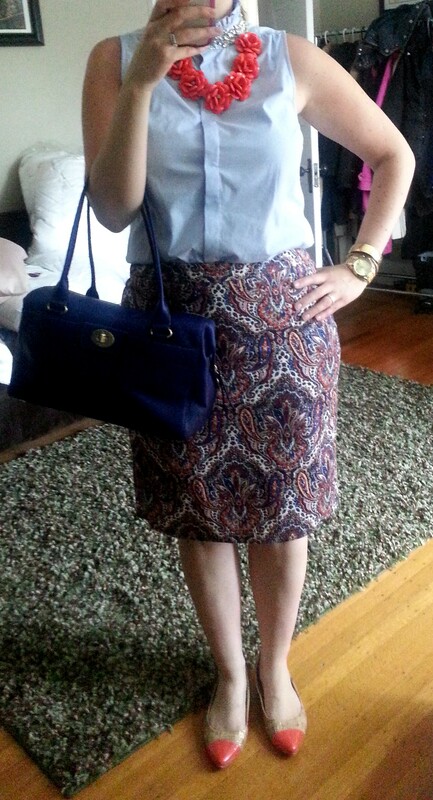 The J.Crew Tilda rhinestone top was easily one of my favorite spring/summer 2013 items this year. I own it in both white and oxford blue and I love that I will be able to wear it year round, either layered under a crewneck sweater or cardigan or solo like today when it’s going to be 90+ degrees outside. My only complaint about this blouse is that you really do have to wear it buttoned all the way up to get the full effect on the collar, or else the collar flops funny. It definitely does not stand up like it does on the website photo…or at least mine don’t. I know this blouse is pretty fancy in it’s own right…but I still feel like when I wear it totally buttoned up that it’s just missing something. Like another necklace. Because, why not, right? So this morning…I went for it. 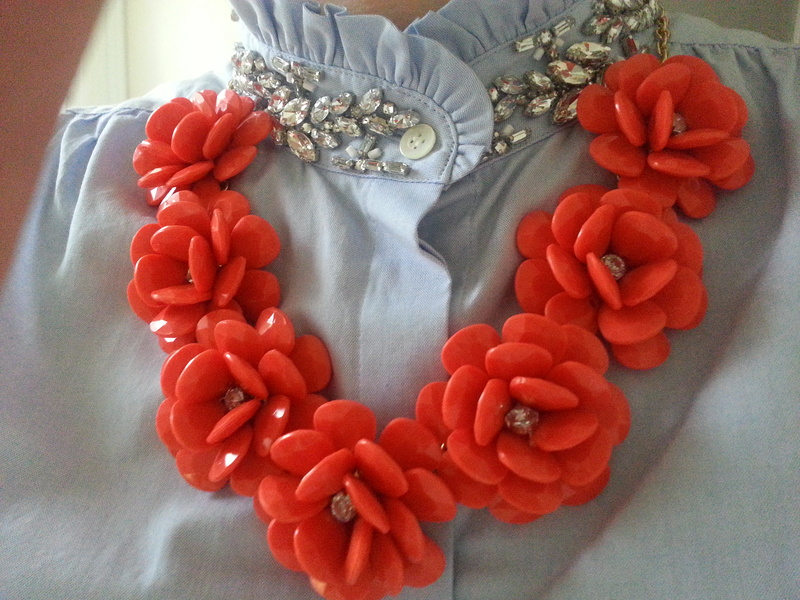 I opted for my J.Crew inspired beaded rose necklace and decided the rhinestone flower centers would coordinate nicely with the blouse. A tiny part of me thought it was a bit much…but…not enough to not wear it. I don’t often pose with my handbags since I usually carry the same one daily…but…I have a new beauty from the Kate Spade outlet that coordinated perfectly with today’s outfit. I’m in love. Here’s a closeup of the blouse/necklace combo. So…what do you think? Too much or a good combination? I don’t think all necklaces would work with this, but I think I’m down with doubling up in the future if the combo is just right. Thanks for visiting! !